I have a confession to make. I have the worst skin care routine. As in, I don’t have one. The older I get the more I realize how damaging that is and has been to my skin. 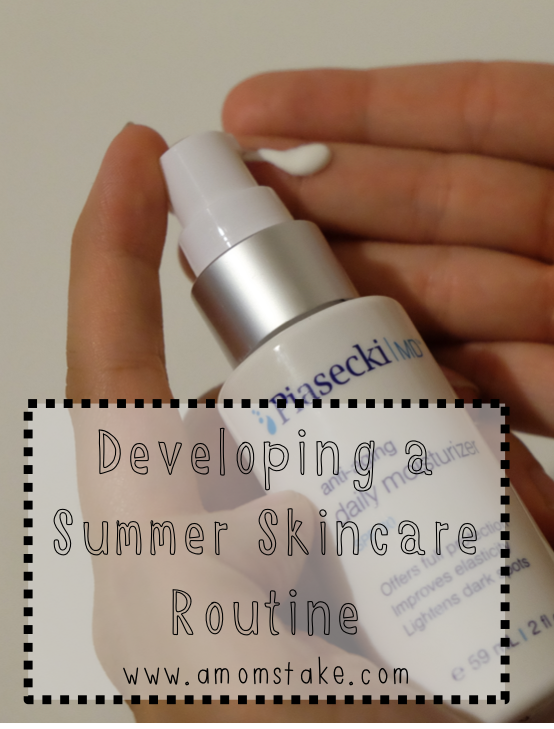 I am trying really hard to be better and I had a few questions about what my skin care routine should include, especially during the summer. I received compensation and skin care items in exchange for this post. All opinions are my own. Why is it important to develop a skin care routine? There are two basic reasons a skin care routine is important. First and foremost, proper care of skin is like maintaining your car with regular oil changes and tune-ups – the main difference being that skin needs this every day. The skin is the largest organ in the body, and sustains the most and concentrated exposure to the environment. A regular skin care regimen keeps the skin clean and healthy which minimizes sun induced damage, inflammation, breakouts, and accelerated formation of fine lines, wrinkles and color changes. Second, the best functional and cosmetic results are achieved with regular skincare use. The best marathon performance comes after many months of training every day; not intermittent training. Applying that to skincare, good products will help the appearance and health of the skin if applied once, but are far more effective if used every day. A regular routine becomes habit and ensures the best and longest lasting results. What should a routine include? This is a fantastic question because there are millions of products on the market, with multiple claims, most of which are based on very little real science. If we listen to marketing, we would be lead to believe that we need to dedicate 12 hours a day applying 19 different steps/products to our faces. There are only four aspects of skincare that are scientifically proven to provide health, safety and cosmetic benefits. Make sure your skincare routine has these. Cleanse. The face is exposed during the day to light, bacteria, wind, chemicals (makeup and air pollution) micro-trauma, stress, mosquitos, … you get the drift. What’s even more profound and important is normal skin cell turnover (which is a constant and forever process of the outer layer of cells dying and piling up on themselves on the skin surface) creates a growing buildup of dead cells that clog pores (leading to pimples and breakouts) and are a perfect environment for bacteria to grow and breed, increasing inflammation and contributing to worsening acne and fine lines in the skin (which look aged and worn), dryness and red/blotchy skin pigment. So cleaning the skin every day is really important. Cleanse morning and night in the least traumatic way possible. While ultrasonic brushes feel good initially, I recommend not using them as over time your face will increase cell production in response to the trauma. Cleansers with soap also cleanse in a traumatic way, leading to further skin production. Find a gentle, soap-free cleanser that lifts dirt, grime and dead skin cells without causing un-do trauma to the face. Sunscreen. A good skincare regime should have an SPF of 30 or more in the morning moisturizer. It should say “broad spectrum”, meaning it protects from UVA and UVB rays. Parents are busy in the morning getting themselves and their kids out the door. Anything that can save a step helps. If sunscreen was not in our moisturizer, there is no way my wife and I would remember to apply every day. Sun damage causes skin cancer and pre-mature aging/wrinkling of the skin. Because hanging out inside all day is not healthy either, sunscreen, in my opinion, is the most important part of skincare. Vitamin A. Retin-A is the only scientifically proven ingredient that will decrease the appearance of wrinkles. It increases cell turnover, minimizes wrinkles and clarifies the skin. Some Retin-A, when applied at the surface, can cause redness and flaking. Find a night product that penetrates beneath the upper level of the skin. This decreases the side effects while ensuring the benefits of Retin-A. Vitamin C. Vitamin C has been scientifically proven to decrease hyperpigmentation, or age spots. Vitamin C is an integral part of an effective night cream. Many night serums or creams do not have an ingredient to bind the Vitamin C to the skin. With these products, most of the product will rub off on your pillow, unless you are a perfectly still back sleeper. Find one that uses something like sericin silk to bind the vitamin to the skin. How should this routine change for different seasons, specifically summer? With summer here, more of our activities are outdoors. On days when you are not in direct sunlight or are not getting wet in the sun (sweating or swimming), applying sunscreen once a day is enough. If you are in the sun for more than 2 hours, make sure you reapply. If you swim and towel off or sweat, reapply your sunscreen. Sunscreens are often waterproof, meaning they will stay on the skin if it gets wet, but they are not towel proof – they are easily toweled off. Other than additional sunscreen, a solid skincare routine based on the four scientific principles, should not change seasonally. What are the best ways to protect your skin during summer? The FDA has developed stricter rules on sunscreen labeling, which makes your job much easier. Find one that is SPF 30 or greater and is broad spectrum – meaning it blocks UVA and UVB light. Nowadays if they carry these on their labels, they are a good sunscreen. Assuming your sunscreen is SPF 30 or greater and broad spectrum, buy whatever you will wear. More expensive, does not mean better. Buy what is affordable and comfortable for you. If you won’t wear it, you might as well have not bought it. For the face, which has the most sun exposure and the greatest chance of developing into skin cancer, use a daily moisturizer with an SPF in it. This will increase the likelihood that you’ll use it. If you swim or sweat, please re-apply. While a sunscreen may be waterproof, it will come off when toweled. If you or your children are in the sun for more than 2 hours, re-apply sunscreen. Try the powder sunscreen for kids. Kids can learn to apply and at least mine feel very grown-up applying their own sunscreen. It’s not greasy, will not sting eyes and goes on very quickly. Please enjoy the outdoors with your family, but do so responsibly! From a health perspective, the benefits of playing outside with your kids far outweighs the costs of applying and reapplying sunscreen. I am so grateful for him answering all my questions! I had never even thought about toweling off my sunscreen and I had no idea they even made powdered sunscreen! That would be so nice, especially here in Arizona wear we have to apply sunscreen like it’s summer time, year-round! I have been using Piasecki Md‘s skin care kit for just over two weeks and my skin already feel 1000x better. Here is the part that really amazes me, the whole skin care kit is only $55. I have some moisturizer that retails for much, much more than that and I like the feel of this one better. Not only are the products great and affordable, but they donate profits from sales to charities and groups that support kids. I am excited to give my skin the care it needs with a little help from Piaseki MD! Visit their website here to find out more about their company. I have a daytime and night time skin care routine. My night time includes cleansing of course, and then I use tea a tiny bit of tree oil mixed with aloe vera oil, and a pm moisturizer. Sometime I use a vitamin e oil. I also use a scrub a few times a week. During the day is the same almost, but a am moisturizer with a spf of 30 or higher. That is a great price for some awesome skin care! Thank you for sharing! You look gorgeous! I completely agree that having a skincare routine is important. I NEED to start one! I love summer but the sun does so much harm to your skin if you don’t protect it. This is a great kit to have. What great information. I am in my mid-thirties and still don’t have a great routine. Thanks so much for the info! I’m terrible about much more than moisturizer. These sound like wonderful products. I’ve only started using lotion with SPF in it in the last year, so important for the skin! I have to change my skin care in the summer but have not heard of Piasecki. Looks worth checking out, and for a decent cost. I believe most of are guilty of neglecting our skin. This is a great start. Thanks for sharing. It is so important to have a skin care routine especially in the summer. The sun can do so much damage to your skin if not properly protected. I feel like I am always in a rush, so any routine I undertake has to fit my constant motion. I like the simple, quick routine that you shared with us. Maybe there’s hope for me yet. I love good skincare products because they really do keep my skin hydrated, and healthy. I never used to use a face wash but now that I use mineral makeup it’s a must. I am horrible about my skin! I really need to start thinking about an actual skincare routine! Great reminder! I’m terrible with remember to wash, but I always use sunscreen… so that’s something! I need to take better of my skin, especially as I am aging. It’s so important to take care of your skin. If your skin isn’t cared for now, it’s going to look terrible down the road! I have some nice skin care products, but do you know that i am lazy in using them. I will be good for a couple of days, then I quit putting on my lotions and creams. I need to stick with it. This skin care kit looks great. I bake in the sun all summer long, so it’s extra important for me to keep my skin moisturized. Wow what a great deal for some amazing skincare products. I need to start taking care of my skin a wee bit better too!